Turkish defense officials recently revealed that the air force had received six of 40 Anka UAVs they had ordered back in 2013. Eight Ankas have been built so far but two have crashed during testing. Anka is actually delivered as a “system”. Each Anka system consists of three UAVs plus ground control equipment and all necessary maintenance and ground operations gear. Looking very similar to the American Predator, the Anka is a 1.6 ton aircraft propelled by a rear facing propeller. Payload is 200 kg (440 pounds) and endurance is 24 hours, and Anka can operate up to 200 kilometers from its controller. Max altitude is 7,900 meters (26,000 feet). A UAV like this would sell for over $2 million each. The Turkish military was supposed to receive its first Anka by the end of 2013 but that was delayed by technical problems. Turkey also announced a larger (four ton) version of Anka that can carry missiles or a lot more reconnaissance equipment. That has also been delayed and none have entered service yet. Meanwhile Turkey has developed and deployed workable UAVs. These are usually less ambitious than Anka and borrow heavily from commercial technology that has already proved itself. A small Turkish private firm developed the Bayraktar Tactical UAV which entered service with the Turkish Air Force in 2014. So far the Turks are the only customer. Bayraktar Tactical is a 650 kg (1,433 pound) aircraft with a 40 kg (88 pound) payload and an endurance of 24 hours. There is also a Bayraktar Mini UAV which is a 4.6 kg (9.9 pound) aircraft that is battery powered and hand launched. Endurance is 60 minutes and the Bayraktar can operate up to 15 kilometers from the operator. The Turkish Army has been using the Bayraktar Mini since 2007. The two Bayraktar UAVs use older, cheaper and more reliable technology and were delivered on time. The Turkish armed forces have about three dozen Bayraktar Tactical UAV and the military has ordered a total of 151. At least one Bayraktar Tactical UAV was lost in action in Syria (February 2018). The Turkish national police have also ordered the Bayraktar Tactical and by 2016 Bayraktar Tactical was equipped to carry two Turkish made laser guided missiles. In September 2016 a Bayraktar Tactical used one of these 22 kg laser guided missiles to kill six PKK (Kurdish separatist) gunmen. Turkish UAV development has been going on since the late 1990s, when Israel was still an ally and supplier of weapons and tech to the Turks. But by 2003 an anti-Israel Islamic government took power in Turkey and local UAV development was crippled but not destroyed. 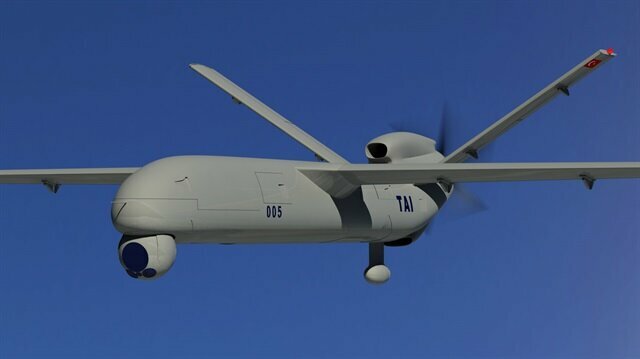 In 2016 Turkey put its new Anka UAV into service for the first time but deliveries of production models only began in 2017. The Turkish Air Force ordered 30 aircraft (ten systems) in 2013. About the same time three export customers (Egypt, Qatar and Saudi Arabia) were announced but none of these were completed because of performance and political problems. Anka was clearly a military UAV, of the type the Israelis had pioneered in the 1980s. The Turkish government apparently ordered a state-owned firm to match the Israeli Heron UAVs that were eventually (2017) returned to Israel. Building large UAVs similar to the Heron has proven difficult to do. One of the disputes with Israel was over electronic accessories Turkey wanted to add to the Israeli UAVs. The Turkish developer was perpetually late and when delivery was made there were problems installing in on the Israeli UAV. The Turks blamed the Israelis and the Israelis kept quiet until they got their UAVs back and then details of the over-promised and under delivered Turkish technology were released. This situation was not unique to the large UAVs like Anka but with other ambitious defense projects where the government demanded more than Turkish firms, especially state owned ones, could deliver. With the Israelis out of the picture there was no one the government could blame for the years of delays in getting the Anka operational so few updates were released. The Heron Shoval UAVs Israel sold to Turkey are very similar to the American Predator A (or MQ-1). The Shoval weighs about the same (1.2 tons) and has the same endurance (40 hours). Shoval has a slightly higher ceiling (10,000 versus 8,100 meters) and software which allows it to automatically take off, carry out a mission, and land automatically. Not all American large UAVs can do this. Both Predator and Shoval cost about the same ($5 million), although the Israelis are willing to be flexible on price. The Shoval does have a larger wingspan (16.5 meters/51 feet) than the Predator (13.2 meters/41 feet) and a payload of about 137 kg/300 pounds. Meanwhile the anti-Israel Turkish government thought Shoval would be easy to replicate because Turkey's economy has been booming since 2000 and the Islamic government made good on its pledge to crack down on the corruption that had long crippled the economy. As the economy grew, the government sought to make Turkey more self-sufficient in military equipment, and UAVs are considered part of this program. But this was mainly for show, not for real. One exception was Turkish commercial firms developing, and delivering less ambitious UAVs like the Bayraktar Tactical and Mini UAVs. By 2017 state owned firms caught on. That year STM, a state owned Turkish firm, put on the market three new locally developed UAVs. These UAVs (Alpagu, Kargu and Togan) are simpler and smaller than earlier Turkish efforts. STM declared that the three new UAVs were already in service, which meant that Turkish troops and police tested them and found them useful. What the manufacturers want is export sales and these UAVs address a market that is currently very crowded and competitive. Alpagu is a 3.7 kg (8.2 pound) fixed wing UAV that can do surveillance but is primarily meant for use as a portable cruise missile as it carries half a kilogram warhead and can be guided to a target up to 5,000 meters away by a soldier. This is similar to the American Switchblade, a one kilogram (2.2 pound) expendable (used only once) UAV that can be equipped with explosives. The Switchblade is launched from its shipping and storage tube, at which point wings flip out, a battery powered propeller starts spinning and a vidcam begins broadcasting images to the controller. The Switchblade is operated using the same gear the larger (two kg/4.4 pound) Raven UAV employs. Moving at up to a kilometer a minute, the Switchblade can stay in the air for 20-40 minutes (depending on whether or not it is armed with explosives) and entered service in 2011. This led to a larger version in 2017. This one weighed 2.2 kg (5 pounds) with up to 30 minutes endurance and a 9 kilometer range. Meanwhile Israel was offering its similar Hero 30, a three kg (6.6 pounds) UAV with 30 minutes endurance. Based on past experience Turkey won’t have much luck finding export customers and appears to have put together these three new small UAVs mainly to show that Turkey can develop and ship this sort of thing. The other two new STM UAVs (Kargu and Togan) are based on commercial quad-copter designs. Kargu is a 6.3 kg (13.8 pound) UAV while Togan is a 7.5 kg (16.5 pound) quad-copter design. These also carry a wide variety of accessories already available for UAVs like this. The problem with smaller UAVs like this is that they compete in a crowded commercial market, largely dominated by dozens of Chinese firms. The companies are constantly innovating and introducing new models. Israel recognizes what is going on here and has adopted the Chinese quad-copters for military and police use.